As from 25 August 2018, holders of EASA Instrument Ratings who want to fly performance based navigation (PBN) procedures must have PBN privileges endorsed on their licence. As from 25 August 2020, PBN privileges will be required even on routes that do not actually require PBN. All Instrument Ratings will contain PBN privileges from 25 August 2020 (and all Instrument pilots will be tested for PBN knowledge). To help provide you with sufficient theoretical knowledge, PPLIR Europe has published the PBN Manual. 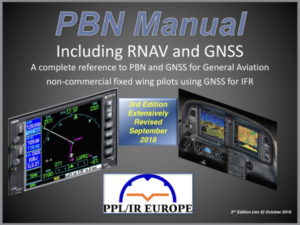 The manual is 200 pages long and fully illustrated throughout, this book will appeal to anybody who wants to know more about PBN, RNP, RNAV, GNSS, Navigational Computers and flying with them. A PDF copy of the manual can be downloaded below. To obtain a hard copy please contact us. The original edition was written by Vasa Babic, this third edition has been heavily rewritten and revised by John Shannon and Timothy Nathan; all the contributors are PPLIR Europe members and acknowledged experts in the field and will make you an expert too! Includes: PBN, RNAV and RNP theory; GNSS Navigators; RNP (GNSS) approach procedures; and much more besides.